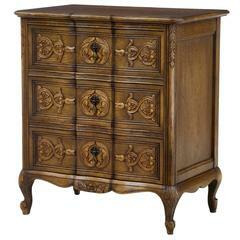 Carved Scandinavian concealed chest of drawers, circa 1940. Designed in the Rococo style with drop down front to reveal 2 fitted drawers. Canted corners with applied carvings. Applied swag carvings to the front with lion heads. Standing on 4 legs with carved fish on the feet. Working locks and key. Minor surface marks to top surface.